Apps for Good is preparing students for an ever-changing world, offering free creative tech courses for you to deliver in your classroom. When team Light Bike made this impressive entrance! The team from Wick High School went on to win the Emerging Technology category, powered by SAP. When our fantastic shortlisting partners came together to support the ideas of students from across the UK. When students pulled out all of the stops to secure votes for the People’s Choice Award, powered by GoDaddy. When past students returned to pitch their ideas for the Legacy Category, powered by Virgin Red. 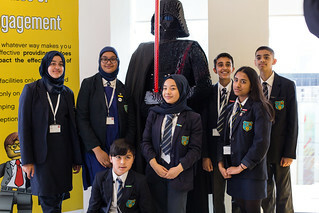 When the Green Team from St. Marylebone won over the panel of Dragons in the Rising Stars category, supported by Spotify. @GreenTeam_AfG by students from @StMarylebone provides young people with a custom plan to reduce your carbon footprint. 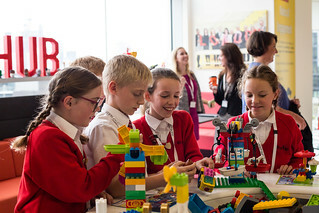 When lucky Finalists in the Digital Explorers category, powered by The LEGO Group, got to visit the Lego offices in London. When Team Kognition from Brighton, Hove & Sussex Sixth Form College won the Future Tech Leaders category, powered by Thomson Reuters. When we announced our brand new machine learning course, powered by SAP. We can’t wait to see machine learning ideas at the next Awards. When we awarded our Impact Prizes for teacher, school and expert of the year – powered by EPAM. Apps for Good wouldn’t happen without our amazing schools, teachers and experts! When everyone finally gathered in the marketplace to share ideas and gain inspiration! Check out the full list of winning ideas here.